Loft conversions are commonplace for creating that extra bedroom, ensuite, office, playroom or home gym. In particular, adding an extra bedroom has long been one of the most effective ways of boosting the value of your property. Planning applications for loft conversions has risen by 22% over the past five years, reaching more than 42,000 in 2017. Due to many potential factors such as unpredictable economic times and fears over the effects of the Brexit negotiations, homeowners are choosing to adapt their homes with a loft conversion to meet their changing needs rather than join the sluggish property market. Many families are also choosing to improve rather than move as a result of huge property price rises in recent years. Converting a loft is a cheaper option than moving and also offers a cheaper alternative to a full extension. Another plus point for choosing to do a loft conversion over an extension is that disruption is limited – you shouldn’t need to move out and rent elsewhere while the loft conversion is being done. The building work is self-contained within the loft space, the builders can work with the loft hatch pulled up. Putting in the staircase can be one of the last things to be done, so the rest of the house can remain unaffected while the work is being done – no large amounts of building dust and dirt going through the rest of the house. There is so much you can do with roof space. If you are lucky enough to enjoy beautiful views from your property you could even consider going upside down. To do this you would be reversing the living space by putting an open-plan living/kitchen/diner in the roof where your time is most spent, with doors onto a balcony to make the most of the view and the bedrooms downstairs. When you start planning your loft conversion, the appearance and use of your loft is often at the forefront of your mind – choosing colour schemes, a feature staircase or furniture. However, one of the big decisions you will have to make in the early stages of the planning process is whether to use steel or timber beams. The beams for constructing your loft conversion are essential to make it structurally sound and must be professionally planned. If you are putting a home gym up in your loft, you don’t want to be wondering if the floor is well supported while you are pounding away on the treadmill! Loft conversion steel beams are used to take the extra load of the build. Beams are typically installed to run from side to side of a property to the other, such as from one party wall to another. So, steel is the most popular choice for beams for your loft conversion – why is this? What are the benefits of using steel? Choosing the right beams for your loft conversion is vital – you don’t want to put your home at risk due to a poorly supported loft conversion. Steel beams are the most popular for loft conversion as they offer the most flexibility when it comes to structure and they are able to reach longer distances. Steel beams are more cost effective than timber beams because they are cheaper to buy yet have great longevity. Both steel and timber beams are strong – but steel beams have more durability. All wood can be susceptible to rot and moisture issues and timber beams are no exception. Timber beams can also be weakened by insect infestation. Steel beams can suffer from rust, but can be painted and protected against rust. Steel can be fabricated to your exact requirements using Autocad and Tekla computer drawing systems with 3D modelling. Steel can also be broken down into smaller lengths then bolted together using splice plates to create the exact beam length in situ. 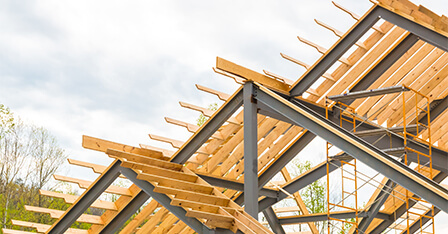 Ultimately steel is a stronger material for loft beams than the timber alternative and it is able to reach longer distances between the supports. Converting your loft is a potential gold mine, creating extra space relatively cheaply. If you choose steel beams you will not only be saving money, but steel beams will prove less problematic in the long run.